Warning: Dates in your diary might be closer than they appear. Oracle just announced that the “EOL date” for Java 6 has been shifted back. From July to November. While it is undoubtedly a relief for many that Java 6 has an additional four month of life left (for many of those few at least, who are aware of this at all) it still means one thing: End of life for Java 6 is in November! 2012! Yes, that means this year. You didn’t know that, did you? So, while this will come as somewhat of a shock to some, it this too soon? That depends how you view it. Java 7 has been in full public release since July 2011, so it will be well over a year of the next major version being on the market by the time Java 6 bites the dust. Time enough for most to update? 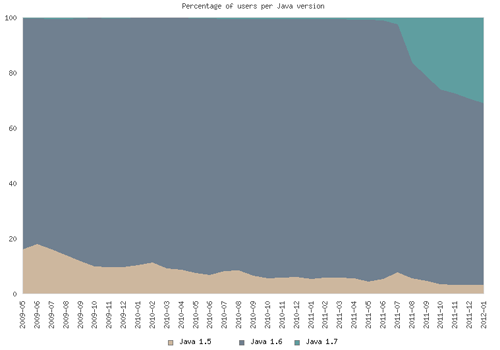 This shows us: Java 7 is currently used by just under a third of BlueJ users. (For Greenfoot, this number is a little lower than this.) About 3% still use Java 5. So, while Java 7 has been out for a while, Java 6 is still by far the dominant version. The reality is: Many universities and schools update only infrequently, and updates to Java 7 haven’t happened yet in many places. We would hope that this changes over summer: many educational institutions upgrade their lab software over the norther hemisphere summer break, so that might give a good boost to Java 7 before November. But will most of the Java 6 installations disappear by then? Most likely not. Especially on Mac OS, it’s difficult: Java 7 isn’t even in public release for that platform yet. So, if you’re responsible for Java on your institution’s machines: time to think about moving on! We have just released Greenfoot version 2.1.0. A new sound API for volume control. This means Greenfoot scenarios can programmatically adjust the volume of sound clips. Several people have asked for this, especially aiming at fading sounds in and out nicely. A new input function: getMicLevel. This function returns the noise level from the system microphone. This makes it very easy to write soem very simple early interactive examples. Support for multiple worlds. Greenfoot now has a function to dynamically show different world objects. This makes it much easier to develop games with different levels. Built-in move and turn methods. Actors in Greenfoot now have turn(int) and move(int) methods which turn and move relative to the current rotation. UI changes. Finding out how to share your scenario on the Greenfoot Gallery has been made much easier. We suspect that many users previously never discovered this important function. So, surf over to the Greenfoot download page and give it a go. Let us know what you think. Over the next few days, I will add a few blog posts here that introduce and explain the new functionality in more detail. So check back soon! Part 1: Using setWorld to create multiple game levels. The most recent addition to Greenfoot is a library that allows programmers to easily use the Microsoft Kinect module with their Greenfoot scenarios. This means that you can now write simple Greenfoot games that are controlled by players body movements. Programming the Kinect with Greenfoot is probably the easiest way to write programs with the Kinect module. Neil Brown, one of our developers on the Greenfoot team, has adapted open source server software that communicates with the Kinect and designed and implemented a Greenfoot library that makes access surprisingly simple. If you are interested to try it yourself — here are the detailed instructions. But beware: you might stand in the middle of your room waving your arms around for the next few days! Some people might look at you strangely, but it’s great fun.